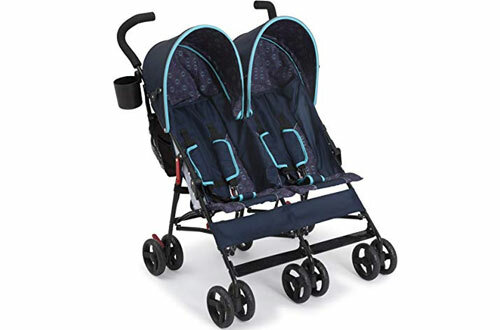 When it comes to shopping for lightweight double strollers, the design is everything. You need some research on your needs before shopping. Double strollers come in different sizes for children of all ages. Some strollers are ideal for only toddlers while others are a great combination for both the toddler and the baby. 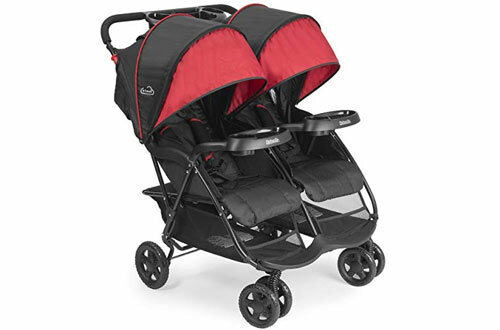 The choice of the best lightweight double strollers to buy comes down to your needs. 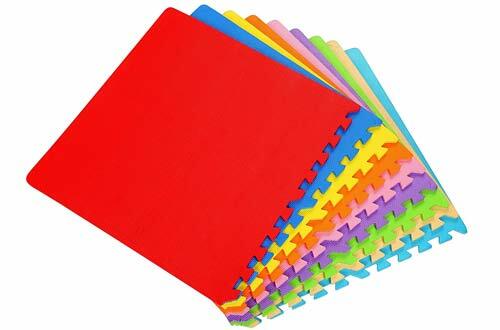 Some of the best designs must be easy to push, lift and fold. 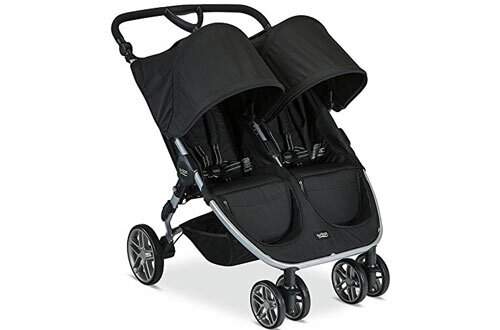 In this post, we are going to help you shop the best double strollers on the market. We’ve narrowed down your search to just ten picks that we think will suit your needs and offer you the best service. Read through the reviews below and select one that best suits your baby’s needs. Click here to read the review of the baby carriers. The Delta Children’s Double Stroller is a great pick to start our list with a wide range of features. 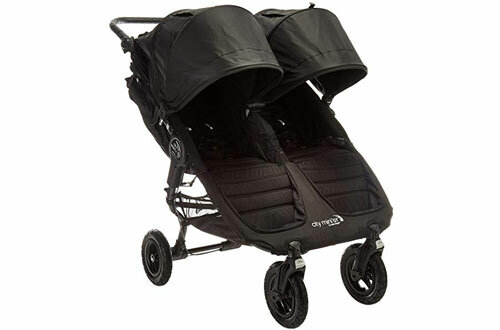 The strollers feature a 5-point harness, shock absorbing wheels and a 360 degrees swivel. They are a safe pick approved for safe use JPMA certifications, CPS and ASTM Standards. 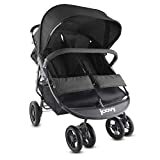 These strollers are ideal for babies up to 35 pounds and feature the European style canopy that protects the babies from the harsh rays of the sun. They also feature a parent cup holder and two storage bags. This is another lightweight and travel-friendly double stroller design weighing 23 lbs. The stroller is a perfect pick for day trips or regular travel. 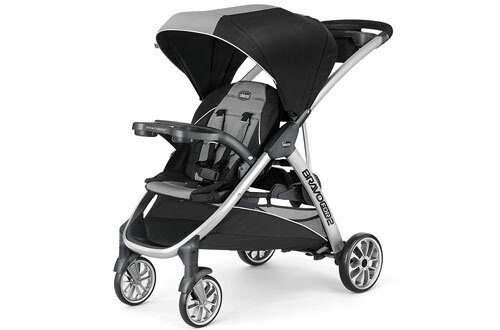 For maximum UV protection, the stroller features a large canopy, and a peek window to monitor the babies. This stroller can hold a maximum of 40 pounds. They feature a reclining seat with a 5-point harness system to allow for comfortable positions for your babies. You also get enough storage space with two drink holders, a parent tray and a removable child tray. Overall, the stroller folds and easily stands for easy transport and storage. 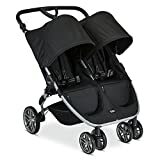 The Jeep Brand double strollers are another great pick with extendable European style canopies for maximum UV protection. 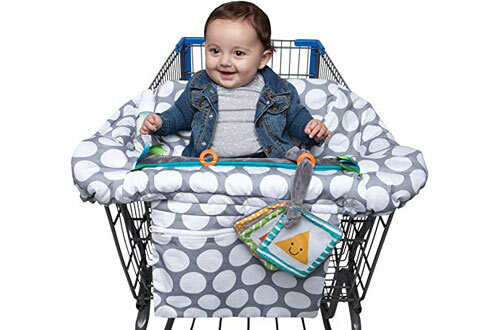 They are a great pick and feature a 5-point harness, a parent cup holder and a multi-positioning reclining for comfort. This stroller can easily be seen at night with reflective striping material. The shoulders also feature soft pads for comfort. Overall, this is a lightweight design easily fitting through 30-inch doors. It also offers enough storage room with double bags on the rear side. 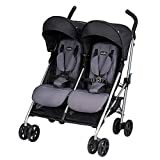 The Evenflow Twin Double Stroller is another versatile and lightweight design to allow for easy use on day trips and travels. The strollers measures 27 inches in width and weigh less than 26 pounds. 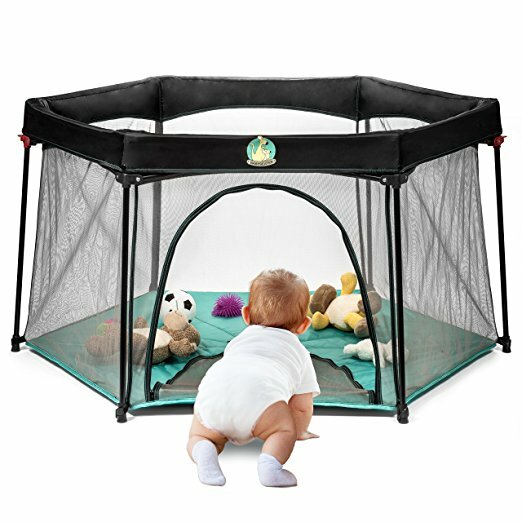 This is the perfect size to fit standard doors and hold children up to 40 pounds. It is a compact pick with one-hand unique folding. This frees your other hand to attend to the children. It also features a swivel lock wheel with front suspension. The seat can also recline in multi-positions for comfort. 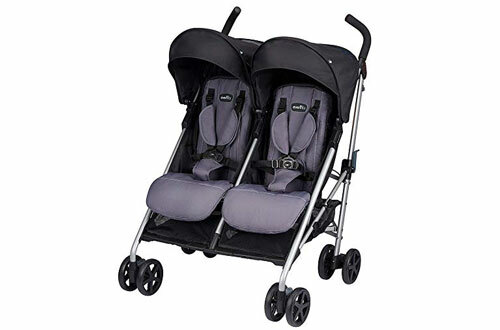 Overall, this is a flexible and comfortable lightweight double stroller with great cushioning. 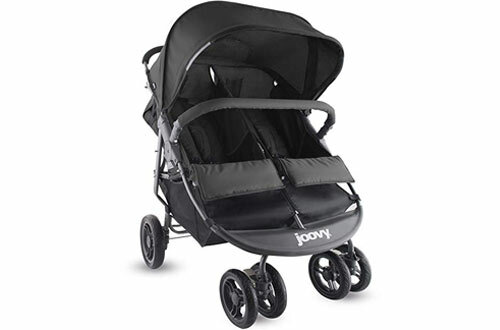 The Joovy lightweight double stroller measures 30-inches in width and can easily pass through most standard doors. It is a versatile pick capable of accommodating 45 pounds of weight per child. 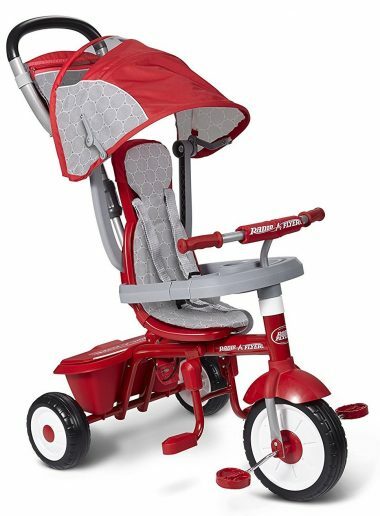 It is a pretty comfortable stroller with reclining seats and independently adjustable footrests. The stroller also offers you a huge basket, removable bumper bar, canopy and a one-hand fold. For parents, there are two cup holders and zippered pockets for personal items. This is a three-wheel double stroller with 5-point harness system and multi-position reclining the seat to ensure your children sit in the most comfortable position. It is a lovely stroller ideal for children from the age of 6 months and not more than 42 inches. This is your best double stroller until your child weighs 50lbs. The rubber pneumatic bicycle wheels measure 12 inches front and 16 inches rear to allow a smooth ride even on rough areas. 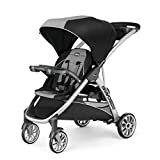 You can easily lock the front swivel wheels through simple brake system transportation and storage is also easier as the stroller folds compactly. Other features include two cup holders, a parent tray and a large storage compartment. Britax is another lightweight double stroller with an infinite seat that reclines with easy to allow comfortable hold of infants to toddlers. The design of the stroller easily allows for a one-hand compact fold. It is a durable pick with UV 50 ventilated canopy, large under seat storage and adjustable hand gear. It is also a versatile stroller to use from birth up to when the baby weighs 50lbs. The Chico Bravo is another top quality selection that accommodates two kids. It also features a platform where big kids can stand or ride. 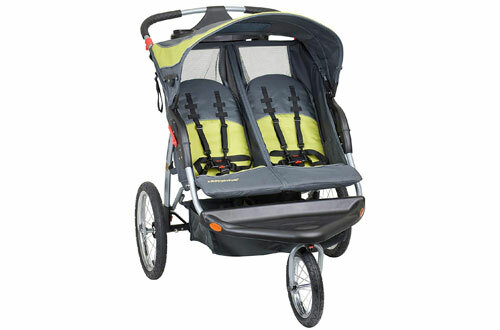 This is the true lightweight double stroller with the seat folding forward and able to fit in your car. 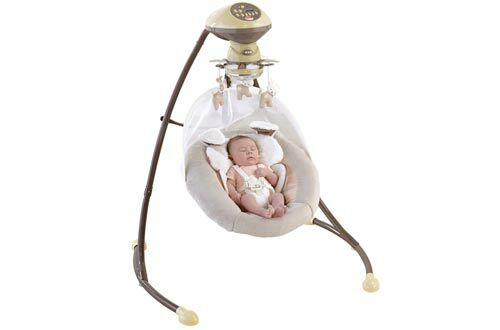 It also features an adjustable canopy, 5-point harness system and a detachable child tray. The extra back seat will easily fold when empty and also features a 3-point harness system. 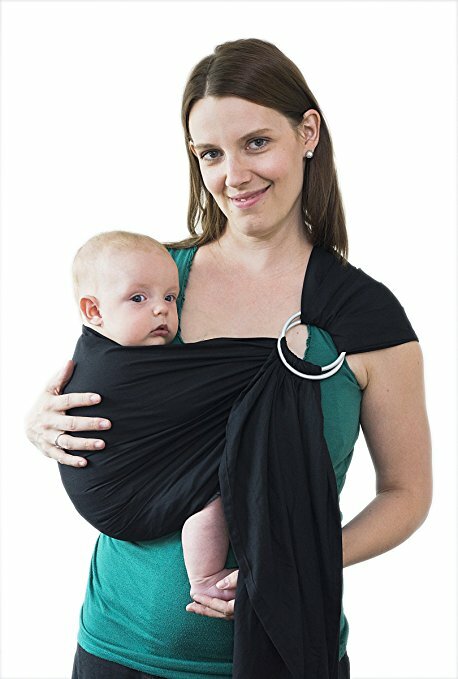 Overall, this can hold two children weighing up to 40lbs per child. On the standing platform, there is a comfortable backrest, and easy grip handles. 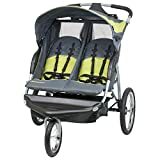 The Baby Jogger lightweight double stroller features patented technology that allows a simple one-hand fold as your other hand takes care of the babies. 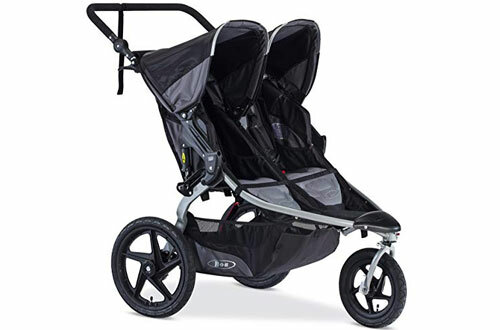 This is a pretty comfortable and safe double stroller with a patented 8.5-inch mini wheel to ride on all-terrain. The seat of the stroller is plush padded and easily reclines to a near flat. The canopy is large, adjustable and features a vented top for better airflow. 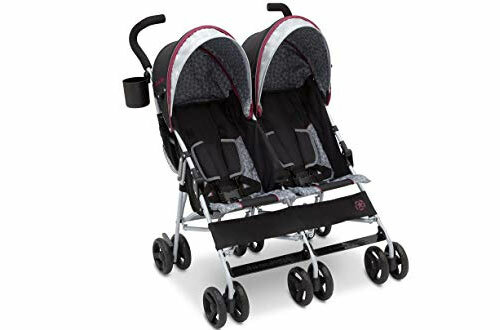 Overall, this is the best travel mini double stroller compatible with most car seats. It also features an adjustable handlebar that suits all heights. The BOB Revolution features a locking swivel front wheel to offer you great stability when on the go. 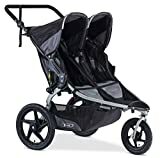 It is s stylish double stroller with air-filled tires to maneuver through any terrain with ease. The bike style suspension tires ensure a smooth ride for your little munchkins. You can also adjust the handlebar with ease to suit your height. It easily reclines flat with a simple one-hand action and folds fast in two- steps adjustments. You can enjoy a cool day trip with a large 50 plus UV canopy. Overall, this is a great stroller ideal for use from birth to 50 pounds. 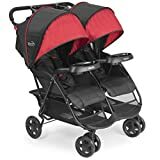 If you have twins or two children not far apart; what you need to move with them around town easily or when traveling is a lightweight double stroller. These are the best lightweight double stroller on the market right now. Go right ahead and make sure you select one from our list today and order with confidence.